At last, the long-awaited second RUNNERS arc! Yay! As I mentioned before, I love story titles with double meanings or wordplay, dating as far back as my work on The Tick. With “The Big Snow Job,” I wanted something that referred to both the snowy setting of the story and the double-cross aspect that tends to happen a lot in underworld business. The cover itself was a bit of a time-saving two-fer for me. I had to come up with new outfits for all the main characters for this story arc, namely winter gear they’d be wearing for most of the story. I decided to make the cover a full-body group shot, 1) because I thought a group shot spotlighting the alien cast would make for a good first issue cover, and 2) because I would then have a nice reference image I could use myself in drawing the outfits! Unlike characters like Batman and Spiderman, where you can pretty much remember everything about the costume after a few times drawing it, with RUNNERS, the characters change outfits often and I try to make them all have different detailing. So it’s hard for me to keep track of everything without some costume reference images to work from. Hmm…maybe I should consider simpler sci-fi outfits like in Logan’s Run or THX-1138. White jumpsuits for everybody! Yes new Runners! Sean, how many issues is the second arc? What do you people think? Do you like a single continuous graphic novel story or do you like chapter breaks? Chapter breaks will probably be pretty natural. Say between scenes etc … But if the 24 page limit is only driven by the print maybe the story can just sort of tell itself and the chapter breaks could come when they made sense in the story. I guess you would still have to consider print when it comes to maybe a trades. Awesome, I can’t wait to read the new story! Will this be made available in a graphic novel eventually? I am SOOOOOOO looking forward to reading “The Big Snow Job”! Can’t wait! To answer your question above, Sean, I would encourage you to continue with chapter breaks (I mean, most graphic novels have them), but there is no need to adhere to a predetermined chapter page length. Like you wrote, since you’re not writing for the single issue anymore, you can pace each chapter as you see fit. 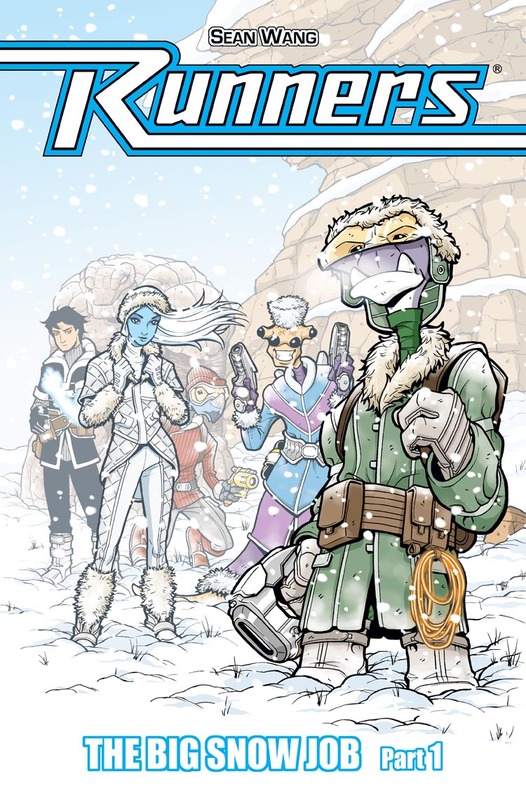 Oh, and put me down for a pre-order of “The Big Snow Job” TPB. I’m sure I’m catching a certain nod towards Star Wars’ Hoth sequence with the outfits of Sky (leia) and Bocc (Han). Thanks for the vote of confidence on the TPB, Keith! I’m guessing as the time nears (which won’t be for a while), I’ll start offering pre-orders for the graphic novel, which will hopefully be a nice way to offset the upfront cost of printing in color (scary!). As for the Star Wars nods, I deliberately wanted the second story to involve snow, as a tribute to The Empire Strikes Back taking place in snow and being the second chapter of the original Star Wars trilogy. So for my second chapter, I wanted to do something with snow, but that was about it. Costume-wise, I didn’t deliberately mean to nod to any particular Hoth outfits, but I think the problem with growing up on Star Wars is that those designs become so iconic in your mind over the years, that you actually start to lose track of what’s “normal” and what’s Star Wars-influenced. For instance, I always planned for Sky to always wear predominantly white outfits, so Leia’s outfit wasn’t an influence there as far as color goes. But when I came to designing her snow outfit, I thought the quilted patch look was a fairly standard snow look. Honestly though, I have no idea if that comes from the quilted look ACTUALLY being pretty normal (for parkas and whatnot) or if I THINK it’s normal because I’m so used to thinking of Leia in her Hoth outfit! So I guess it wasn’t a deliberate homage, but could very well have been influenced subconsciously. As for Bocce, the design was actually just an extrapolation, fashion-wise, of his regular day-to-day outfit (BTW, I’ll be talking about the outfit designs a bit more in future posts). The only intentional element I worked into his snow outfit is actually from Star Trek. I LOVE the away coats that Kirk, McCoy, and Saavik wear in Star Trek II when checking out the space station Regula 1. So I incorporated the look of the coat collar into Bocce’s design. Can’t wait for this to start. I’ve told people at my comic book store about the runners since it first came out. Even bought the trade as Christmas gifts. I will definitely be preordering this when it becomes available. I love this whole comic. just amazing. I’m neutral on chapter breaks – they’re not necessary, but they can help give a little extra shape to a story (and a place to put a bookmark). Text novels aren’t normal serialized anymore but still have chapters. I’d definitely drop the 24-page requirement, though, if you’re not printing single issues. You can still keep them all around the same length if you want to. Cember’s gonna get cold feet though.